So one day out of nowhere, Ryan told me I needed to make a chocolate peanut butter cupcake. And I remember I’ve made this version of a cupcake once, a long time ago, I just never wrote it down. So I set out to recreate it. Easy as cake! I used my go to chocolate cupcake batter that is also used for these Oreo cupcakes and these banana split cupcakes, just changed things up with a peanut butter and cream cheese frosting/filling 😉 . 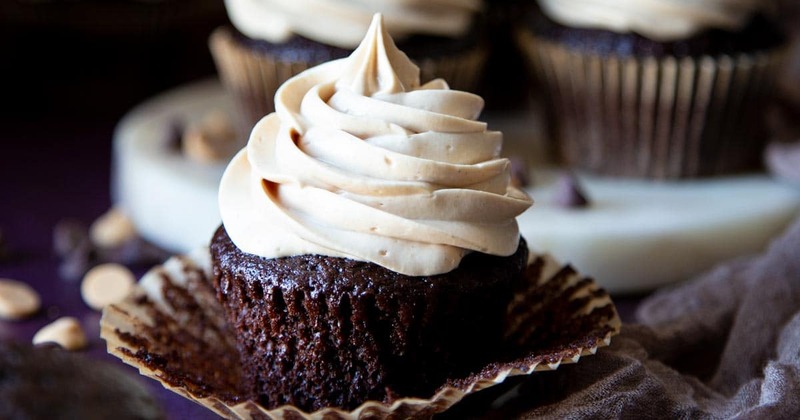 As I’m typing this up, I just thought of another version to this cupcake, fill it with jam/preserved and top it with the peanut butter and cream cheese frosting and you’ve got yourself a chocolate PB&J cupcake! Oh yeah! Take out the buttermilk and egg from the fridge and let come to room temperature. 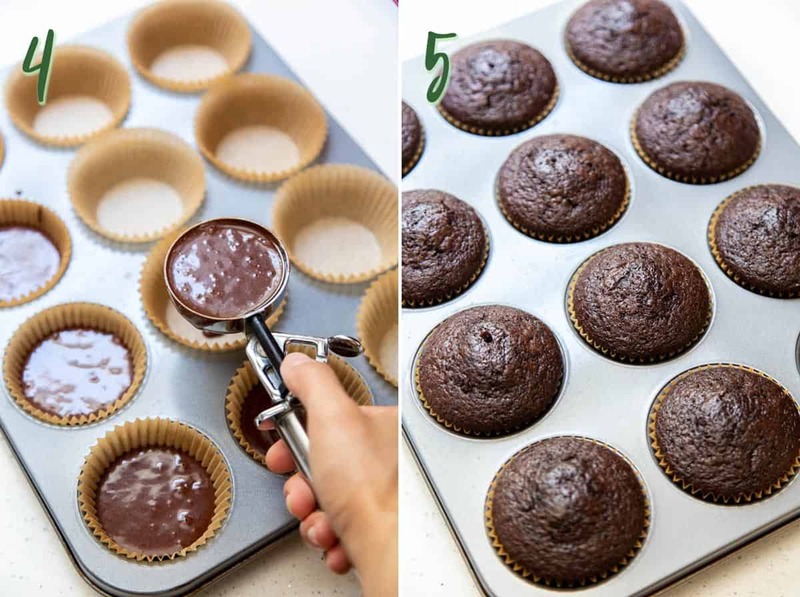 Preheat oven to 350°F and line a regular size cupcake pan with cupcake liner. Put all the wet ingredients, milk, egg, oil and vanilla extract in a medium mixing bowl and beat to combine. Sift all the dry ingredients, flour, cocoa powder, sugar, salt, baking soda, and baking powder together in another bowl. Add the flour mixture into the liquid while mixing at slow speed. Mix only until combine, use a spatula to scrape any flour on the side of the bowl and mix up anything at the bottom of the bowl. 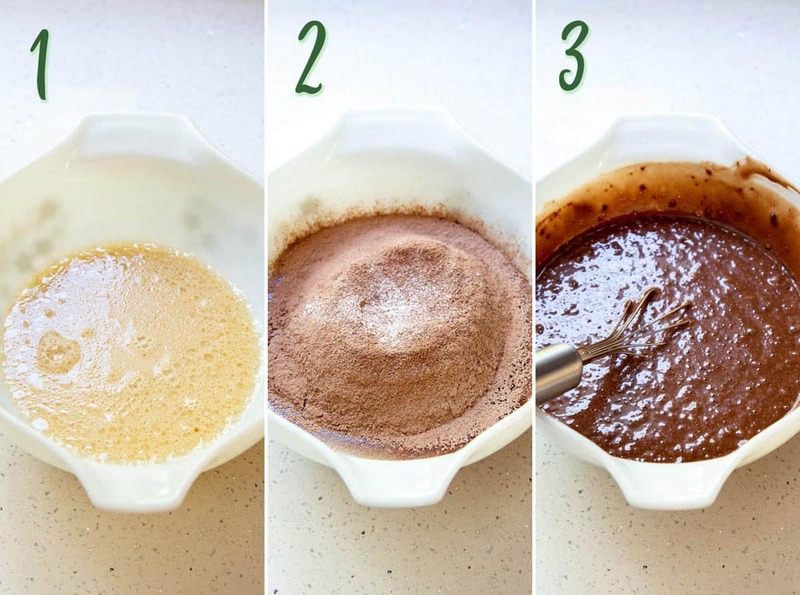 Use an ice cream scoop to divide batter equally among 12 cups. 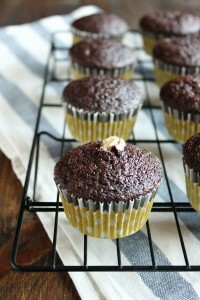 Bake at 350°F for 15 – 17 minutes until an inserted toothpick in the middle of the cupcake comes out clean. 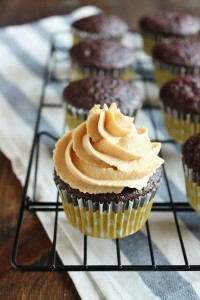 For the frosting, cream the cream cheese and peanut butter with the whisk attachment until fluffy. Slowly add the powder sugar and beat to combine. Transfer about a third of the frosting to a pastry bag fitted with the filling tip (wilton tip 230). Stick the tip straight down into the middle of the cupcake about half way and push the filling in. When the top of the cupcake starts to expand, it is filled. Transfer the remaining frosting to another pastry bag fitted with the star tip, top cupcakes with frosting. 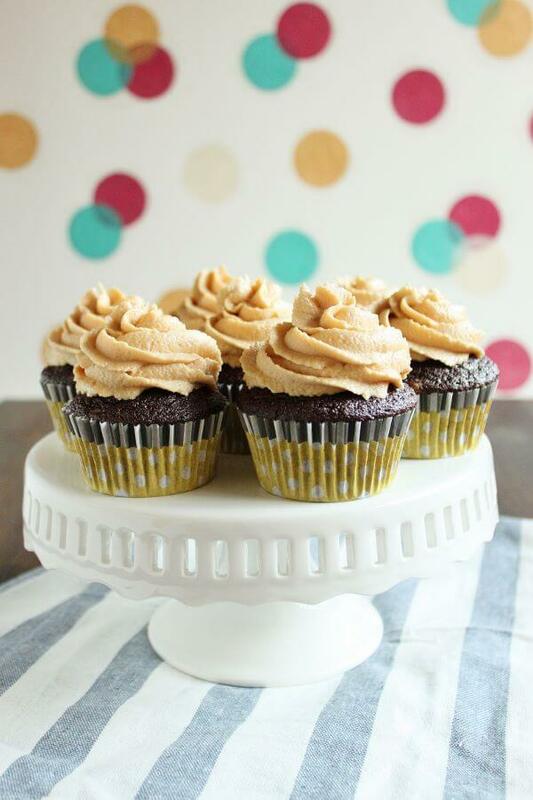 If you use a different type of peanut butter, one that is not already slightly sweetened, you may need to increase the amount of sugar for the frosting. 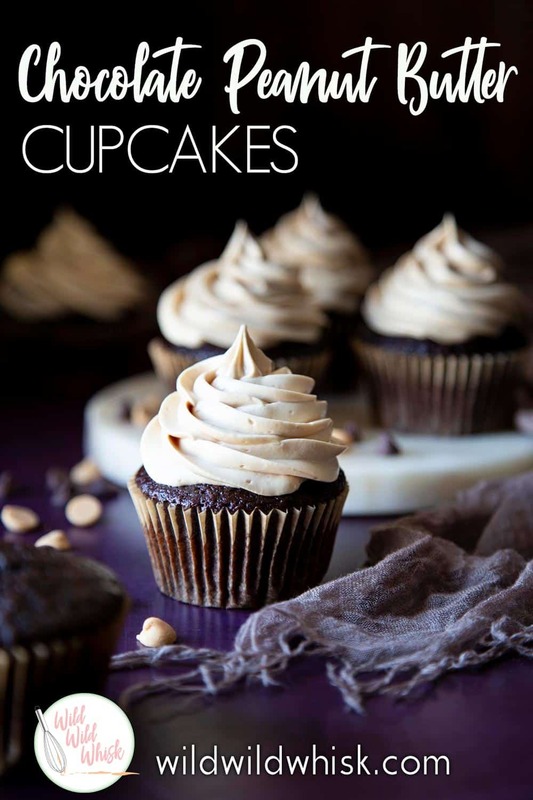 Perfectly baked cupcakes! They look awesome, PB & Chocolate is a match made in heaven 😀 Pinning this! These look wonderful, Trang. 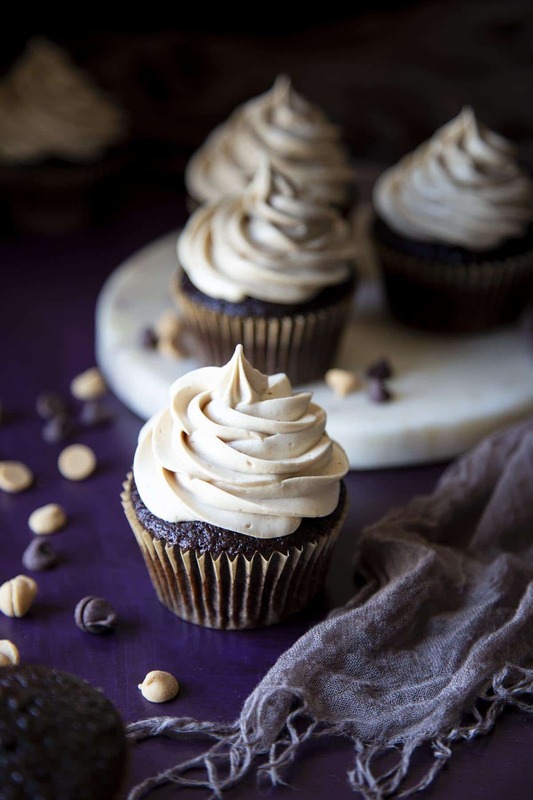 Can’t go wrong with chocolate and peanut butter.